I Thought that Today as we are heading farther into the past, a bit of mine came up, so here's a bit of it: My grandfather before he died was known to the village in Transylvania where he lived as "Dacia." It was never mentioned to his grandchildren until recently when my grandmother mentioned the inscription on the bottom of the photo was in fact, not the photographer we always assumed but his nickname. Hm, so what about it? Well Dacia was a Kingdom that Transylvania was a part of. It was there for hundreds of years until be conquered by the Romans. I wonder is there a connection? 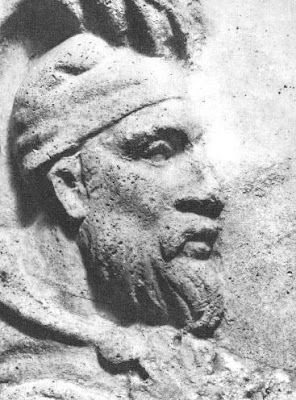 Above is the image of the Roman Emperor Tragan, who defeat the Dacian army. 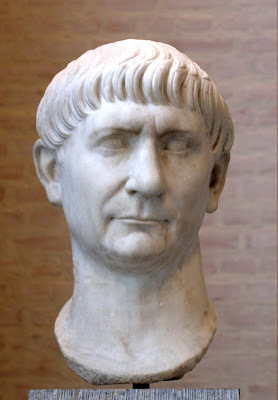 He was a ruler who gained land and power for the Roman Empire. above is a picture of the man Tragan fought against, Decebalus, who in the end committed suicide rather than be marched to the streets of Rome, as a conquered king. 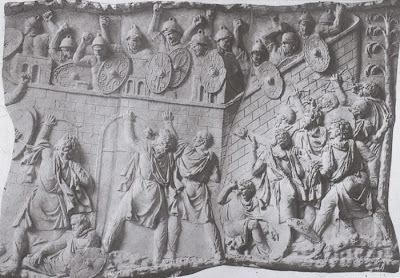 One of the wall reliefs that depict the battle between the two. it is very interesting to see the Romans and the Dacians in this. It has given me a new sense of what Transylvania was like.